Nationally renown oil painter, Larry Moore, is the guest artist at Fifth Avenue Art Gallery for the month of February. Moore will be present during the opening reception on Friday, February 1 from 5:30 p.m. to 8:30 p.m. to answer any questions and talk about his art. Many of his paintings will be displayed and available for purchase. 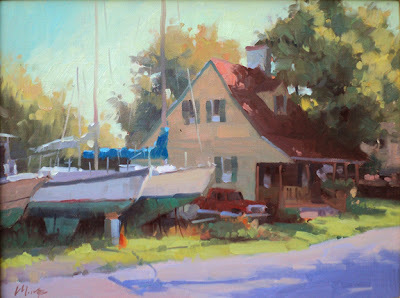 Moore, a prominent “plein air” painter and workshop teacher, is also a Florida native. Plein Air is a French art term that means outdoors. “I have a huge passion for nature having grown up on a river right next to the ocean with nothing but islands and wildlife behind my house. To paint the great outdoors is to give homage to nature and maybe give the viewers of the paintings a reminder of what was and what could still be,” says Moore about his work. Moore lectures and travels with the Plein Air Painters of America (PAPA) and understands the full boundaries of color and the craft of oil painting. An award-winning artist, his works are widely collected and exhibited throughout the United States in private collections and museums such as the Orlando Museum of Art, Laguna Museum of Art, Naples Museum of Art, and the Tallahasee Museum. “Fifth Avenue Gallery is pleased to present an artist of his esteem and this collection of art with a Florida twist called Larry Moore--Migrant Art Worker,” states Jini James, the show's chair and curator. “He's an extraordinary plein air painter with a national following”, she says. Meet Moore and talk to the gallery's member artists as you enjoy viewing the artwork. Complimentary light refreshments are served during the opening reception which is open to the public. His works can be also be viewed at www.larrymoorestudios.com. The Fifth Avenue Art Gallery is located at 1470 Highland Avenue in EGAD, the Eau Gallie Arts District of Melbourne, across the street from the Foosaner Art Museum. The gallery telephone number is (321) 259-8261. Visit us http://www.fifthavenueartgallery.com and on Facebook.